1990 saw the birth on a new phenomenon on the Australian Football scene. The old. much loved VFL competition has been officially replaced by the new AFL. To coincide (un-intentionally I'm sure) with the launch of the AFL season comes the launch of the home computer version. The first ever computer version of Australian Rules Football comes from the land that currently has a plethora of soccer simulations on the market. The tig question that must be asked is. 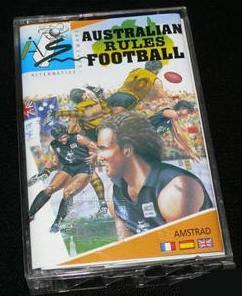 could a game that was programmed in a country that has had limited exposure to this code of football, produce a computer game that faithfully captures the true spirit of Australian Rules? The game comes in two versions. 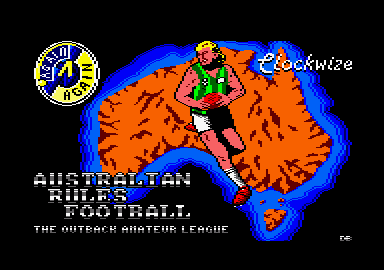 There's the beginners level, or Outback Football League, and the expert level, called the Victorian Football League. The cassette has one version on each side of the cassette, and there is no way to move between versions once you start. Your team, the BAGABAGA F.C (called the Koalas or Hawks depending on the version) commences the season ninth on the ladder. There are 13 other teams in the league and your aim is to try to become league leaders, which automatically makes you the premiers. Your team climbs one place in the ladder for a win. or drops a place for a loss, so to win the flag, just keep winning. Before the first bounce, you can choose the level of sound effects that you require, ranging from silence to full sound. At the end of a game you get the choice of continuing with the current league or starting again. One feature that would have been of benefit here is a save game option. As it takes at least nine games to finish a season, it only seems fair to be given a break and not have to continue through. Both versions play the same, with the expert version being harder. You view the game from above and the field is broken into three screen areas; from the goal square to the 50 metre line, between the no 50 metre lines and from the second 50 metre line to the other goal. 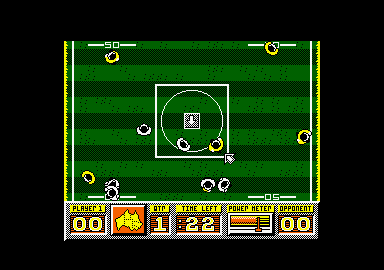 The player that you control is Indicated by an arrow, and if your player is in the wrong third of the ground, an arrow shows you where the ball is. The program makes some use of colour, with your team being dressed in white while the opposition colour changes with each game. The ball is passed by kicking, and a power meter at the bottom of the screen shows you when your kick will cover the greatest distance. If the ball goes to another member of your team, it is ruled a mark. The game pauses momentarily, all the opposition players retreat towards their goal and you can move a player down field to receive the ball. Come the call to play on and the ball is kicked up field, hopefully to one of your players. As you would expect, you get six points for a goal and one for a behind, and your score is shown as a total at the bottom of the screen. Australian Rules Football plays fine, but there are a number of aspects of the program which are not correct. When the ball goes out of bounds, the game restarts from the centre. Scoring a behind also results in a centre bounce, rather than a kick out bv the full back. Both of these features could have been included in the program, as they have similar occurrences in soccer and all soccer simulations include throw-ins and goal kicks. Another problem with the interpretation of the game is that the ball can rebound back into play on striking the goal post, rather than registering a behind. The inclusion of this would have made it a much more realistic adaptation of the game. The names of the teams don't change between levels, and I think it's a great shame that the programmers haven't put the proper VFL teams in the expert level of the game. Australian Rules Football Is not the best sports simulation produced, but it is certainly not the worst I have seen. There are areas that could have been included, and these would have increased the realism level. The levels are appropriately set. with the beginners level being quite easy. Graphics are alright , but the colour of the ball (white) means that it can at times get lost. There is a novel in game score update service that unfortunately, can't be bypassed Not bad game , so give it a go.